Life Membership of the USAFL is a recognition of an individuals excellent service to football in the USA. It is given for a combination of service beyond normal expectations, tenure and specific skills that has a National component. This is not intended to replace club based Life Membership Awards. Life Membership is an Australian traditional of recognition, generally at a club level. The USAFL also recognizes it's esteemed members in the USAFL Hall of Fame. Leigh is originally from Launceston, Tasmania, however also lived, played and coached football in Brisbane for 15 years. He is now living in the east San Francisco Bay area with his son Kai and works as a Materials and Research Engineer. Leigh is the founding President of the Golden Gate Australian Football League, 2005 Division II champions, and has played over 400 games of football in his lifetime. Leigh represented Tasmania three times, Queensland once, and kicked over a hundred goals in a season twice during his career. Andrea Casillas began playing with the Arizona Lady Hawks in 2005. Upon getting accepted into law school in New York she knew that she wanted to continue playing, but traveling back to Arizona would not feasible. Once in New York, she founded the New York Lady Magpies which is in its third season. Even though the team is still young, it has boasted eight players on Freedom and recently hosted its first tournament. Matt is Victorian born, spending most of his childhood and football career in Central Queensland. Matt now resides in Sacramento, California with his wife Amy. As well as coaching the Revolution, Matt is also the current coach of the Golden Gate Roos, Sacramento Screamers and prior to moving to California, was the coach of the Baltimore Washington Eagles. Matt has lived in the United States since 2005 and has played and coached senior football in both Brisbane and Sydney. Kathryn (Kat) was born in Adelaide, Australia to non-Australian parents but grew up in the USA after living in 4 countries before the age of 7. She was first introduced to footy when ESPN launched in 1980 and was a founding member of the Minnesota Freeze in 2004. She was the leading driver behind the current day women's competition in the USAFL and was responsible for making the women's division a part of the USAFL Nationals. Jeff has been a member of the USAFL since 2000. He has been a member of the Nashville Kangaroos and been with their board for 9 years (2001, 2003-2010), President - 4 years (2007-2010) and Secretary/Treasurer - 1 Year (2001). 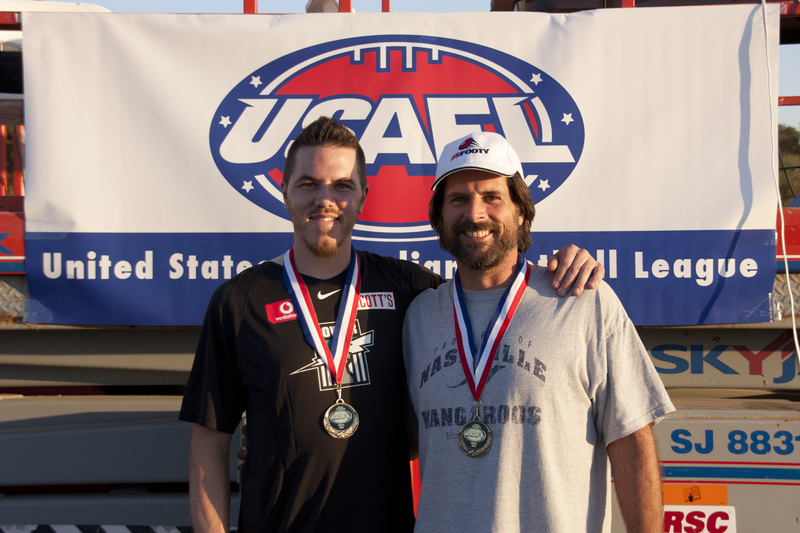 Jeff has Played 100+ Games for Nashville Kangaroos with 3 MAAFL Championships and he played for the USA Revolution in 2008. Jeff's Field umpiring experience includes nearly 200 games, 2007 USAFL Umpire of the Decade Award, 2005 and 2011 International Cup Grand Final - Field Umpire, First non-Australian to be Accredited at Level 2 and 2002 USAFL Scholarship Umpire. Steve has volunteered as the trainer to the USA National Teams since 2002. He has supported both the USA Revolution and more recently the USA Freedom at all AFL International Cups and the past four 49th Parallel Cup tournaments. Steve was awarded his Life Time membership during the 2011 International Cup in Melbourne. A veteran of over 380 Australian Rules Football (ARF) games, Wayne Kraska is one of the sports leaders in the Australian community in Atlanta. Wayne serves as President of the Atlanta Kookaburra's ARF Club.. His experience as a coach and umpire has taken him all over the USA, and achievements include introducing and managing the most successful USAFL National Championships on record, that featured 27 teams and some 750 players. Alan has been one of the premier coaches within the USAFL through its first ten years. He coached and played with Boston for many years, before his work moved him to Houston. Alan was also the American Revolution coach for the 2005 International Cup. Alan was a galvanizing force for the Revolution and brought the players together to create a great Revo team. He took the team to third at that Cup. Alan has also been recognized as the Revolution Coach of the Decade. Alan is an exceptional player and also made the starting 18 of the USAFL All-Star team of the Decade. Denis Ryan has been a member of the Baltimore-Washington Eagles since 1998, serving as a player, coach and Vice President of the club. In 2001 he joined the US national team, the USA Revolution, as an Assistant Coach and has since played an instrumental role within the USAFL, developing and implementing Coaching courses, school PE programs and the co-ed Ausball. Member of the American Revolution in 1999, 2000 and 2001, He made the trip to London as part of the team than competed in the Atlantic Alliance Cup. Represented the West in the USAFL East/West All Star Games in 2005, 2006, and 2007. Mike has the distinguished honor of starting two clubs in the USA. He started Nashville prior to the forming of the USAFL and then when moving to Atlanta in the late 90’s took it upon himself to kick-start the Atlanta Club. Mike is the current coach of the Atlanta Kookaburras Club. Mike was one of the people involved in the famous meeting behind “the barn” that started the USAFL. He is also one of only two people to play in every National Championships. Mike represents everything that is right about a club based organization. Steve has been one of the premier umpires in the league despite coming from Sydney. Steve started umpiring in 1999. In those early days his city, St Paul, Minnesota, did not have a team so he traveled extensively to umpire. He served as the first Umpires Coordinator and then as the Umpires Coach for 5 years. He has been critical in building the fraternity of umpires – as he is often quoted the “esprit de corps” of umpires.